A traditional money chest was hand crafted in China in the late 1800's. 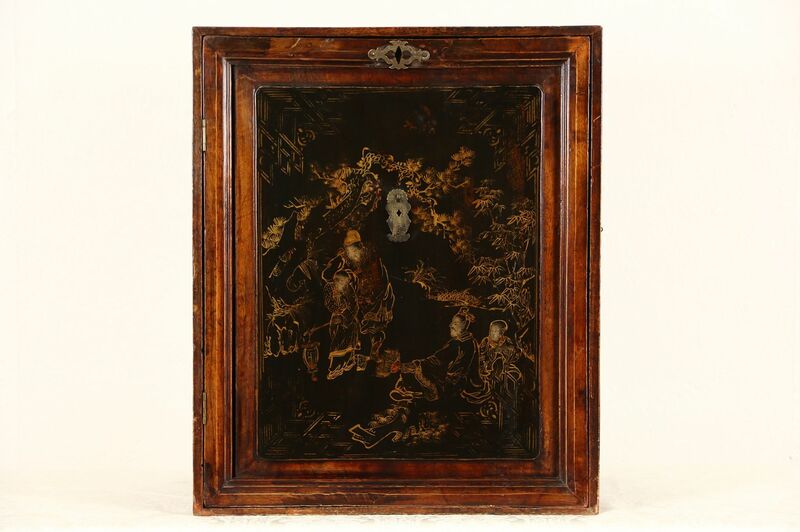 Pine and ash, the original finish and exquisite hand painted lacquer scene in the door panel have wonderful antique patina. There are just enough mars and wear for a little character, preserved long ago with clear varnish. There is no key for the lock, inside are tiny drawers. Corners have tiny finger dovetail joints. Used by a merchant for cash and receipts, there are handles for carrying this historic tabletop furniture. Size is 19 1/2" wide, 13" deep and 23 1/2" tall. See 22 photos that enlarge to full screen size.